Lunar New Year 2016 with Crystal Jade, Singapore | JACQSOWHAT: Food. Travel. Lifestyle. - Prosperity yu sheng with abalone and red pomegranate 鸿运红石榴鲍鱼捞生, $138 for large | $88 for small. Available at Fine Dining outlets for takeaway and dine-in. Limited quantities available. - Reunion baby abalone yu sheng 贺岁团圆金鲍仔捞生, $66.80 for large | $40.80 for small and dine-in. Available at Crystal Jade Jiangnan / La Mian Xiao Long Bao and Crystal Jade Kitchen for takeaway. For both renditions - The Prosperity yusheng pairs essential ‘lo-hei’ ingredients with a sour plum and pomegranate dressing with slices of Mexican abalone and pomegranate seeds that resemble red rubies. The Reunion baby abalone yusheng presents the well-loved winsome version. Chilled asparagus 冰冻芦笋 $20, spears of steamed then chilled sweet asparagus that is arranged like a prosperity plant. These crunchy stock of asparagus pair with sesame sauce is indeed addictive. Available at Crystal Jade Fine Dining Restaurants. 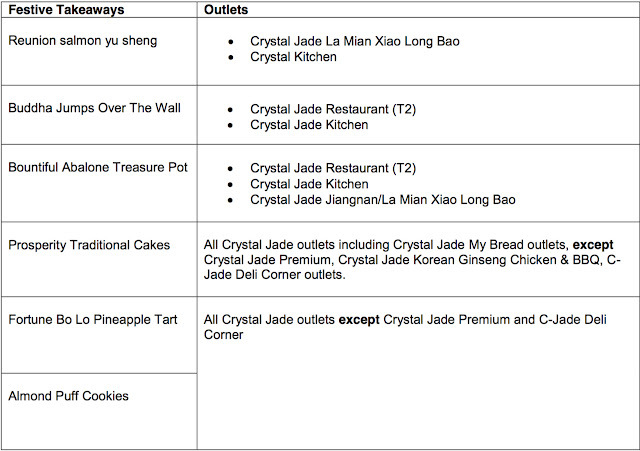 - Luxurious abalone treasure pot 鲍鱼海味盆菜, $318 for 6 pax | $498 for 10 pax. Literally like a treasure pot, this pot is brimming with 15 different premium ingredients including abalones, sea cucumber, dried oysters, smoked pig trotters and fish maw, all braised in a robust thick sauce. Customers who purchase the Prosperity Treasure Pot (for 10 pax) will get to also enjoy a Prosperity YuSheng with Mexican Abalone for $98 / $58; for the large & small packs respectively (usual: $128 and $78). - Bountiful abalone treasure pot 丰收海味盆菜, $238 for 5 pax | $418 for 10 pax. Prepared with choice ingredients such as fish maw, fresh prawns, oysters, dried mushrooms and ten-head abalone, this hearty pot of goodness is a definite show-stopper on any reunion table. Available at Crystal Jade Restaurant (T2), Crystal Jade Kitchen, Crystal Jade Jiangnan/La Mian Xiao Long Bao outlets for takeaway and dine-in. Steamed herbal xiao long bao 药膳小笼包 ($6 for 4 pcs). Available at Crystal Jade La Mian Xiao Long Bao. Popular for its affordable dim sum, noodles and congee bowls, Crystal Jade Kitchen’s culinary team has conjured several highlight Lunar New Year dishes. Like this Thai Style Pork Knuckle $28, it is crispy on the skin and tender on on meat. With a touch of asian spices, love this one! Available at Crystal Jade Kitchen. Another item from Crystal Jade Kitchen’s culinary team, here's Sautéed scallop and coral mussel with XO sauce XO 酱带子珊瑚蚌 ($28). The succulent scallops are irresistible while the coral mussel carries the wok-hei flavour that enhance the overall dish. Available at Crystal Jade Kitchen. For desserts, this is one of my favorite - Steamed Pumpkin Glutinous Rice Ball with Bean Paste ($4.80 for 3 pieces). This fluffy mochi texture like rice ball is filled with smooth bean paste, indeed a satisfying sweet treat. This ondeh ondeh lookalike is available at Crystal Jade La Mian Xiao Long Bao. Lastly, Double-boiled Water Chestnut with Egg White is available at all Crystal Jade Prestige. From 4 January 2016, orders can be made online at www.crystaljade.com (collection can be made from 15 January at select outlets). 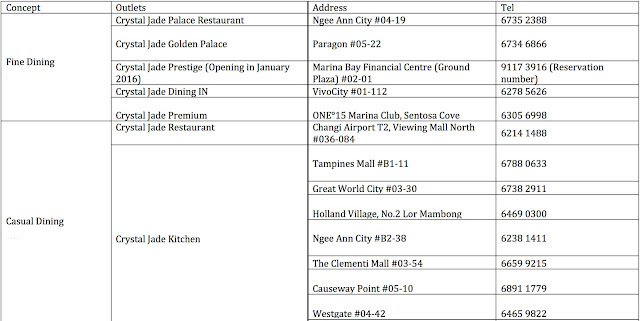 From 15 January, you can place orders through the festive hotline at 6512 0833 or at all Crystal Jade restaurants and bakery outlets. Also, this upcoming Chinese New Year, Crystal Jade will be raising funds for Kheng Chiu Loke Tin Kee Home, a sheltered home that provides care and meals to the destitute, frail and fairly frail elderly. 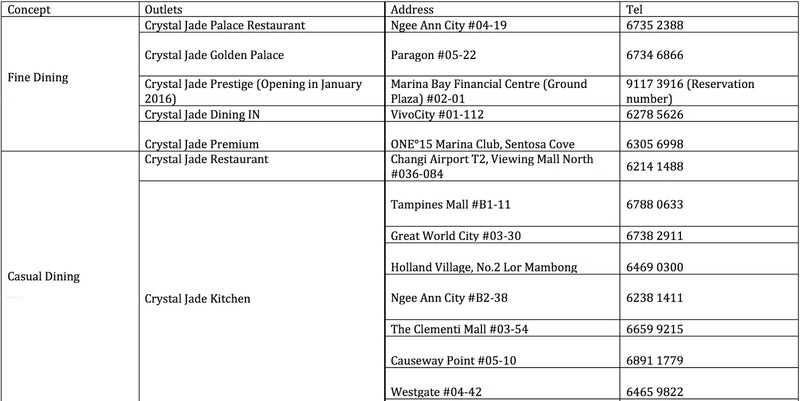 From 1 Feb to 22 Feb 2015, Crystal Jade will be donating $10 for every order of any Chinese New Year set menu at select restaurants to this worthy cause. Nice.